This pianist who crossed the road of jazz at 22 years old through two artists, John Coltrane and Miles Davis, will be released "In The Street" at Jazz Family, and you will be pleased to see that John Coltrane and Miles Davis are not the only ones artists who inspired him. On this CD, two titles are written by Laurent Fickelson, while the others are signed Coltrane, Monk or Strayhorn. Once this is specified, let us get to the heart of the matter. Certainly, at first, "In The Street" may seem relatively classic, but it is not. Indeed, the contemporary vision of these music Laurent Fickelson, surrounded by excellent musicians Thomas Bramerie on bass, Eric Prost on saxophone and Philippe Soirat on drums, makes this CD a jewel, more than one title. 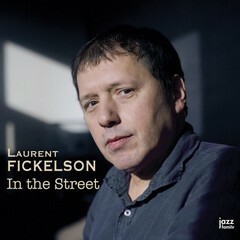 After years in which a very contemporary form of European jazz has reigned supreme in the jazz world, some artists have succeeded in renewing the genre and looking further at more classical works, as is the case here with CD "In The Street" by Laurent Fickelson. That's why this album that we have the pleasure to present to you is also another favorite of the writing of PARIS-MOVE.